Fig 1. Front of the little handout. Firstly I'll run through the funeral, what happened to give some background understanding of the event. The family car arrived, which was blue, for my grandmother and off we went. The funeral was only a short distance away so the trip was quick. On arrival I saw the hearse was also blue, I'd never seen a blue hearse so that was rather fun. It was just a basic ford hearse, a fairly common one and no different to many others I had seen save its color. We entered the chapel, a rather nice and spacious place. The coffin was down at the end, lying parallel to the stage and with the podium slightly to the side. 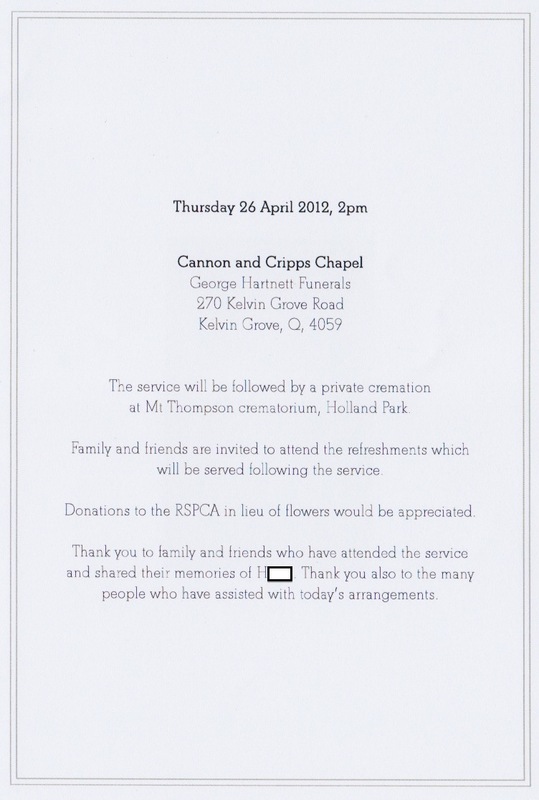 The service went well, short and to the point while still covering the details. 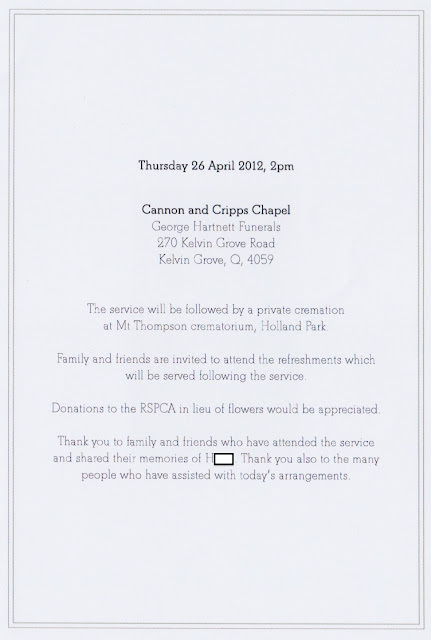 It was a fairly formal service, kind of surprising considering how liberal my grandfather and the family were and are. At the end of the service I and three other family members wheeled the coffin out, loaded him into the hearse and watched it drive off. Then we all went back inside the chapel and had some food. The food was provided by Celest Catering, who are InvoCare's preferred caterers as they always do a very good job. Overall it was a good funeral and everyone came away happy. Fig 2. Back of the handout. His date of birth is wrong here. He was born 11 of September 1929. We had 100 orders of service printed up on nice paper. My aunt organised them from the design to the printing and she did a rather good job. It was also the exact number we needed, I noticed there were about 20 or so left over which meant everyone got one and not too many went to waste. But we also had little hand outs which I really liked. The hand outs were small silver cards, about double the size of a business card. 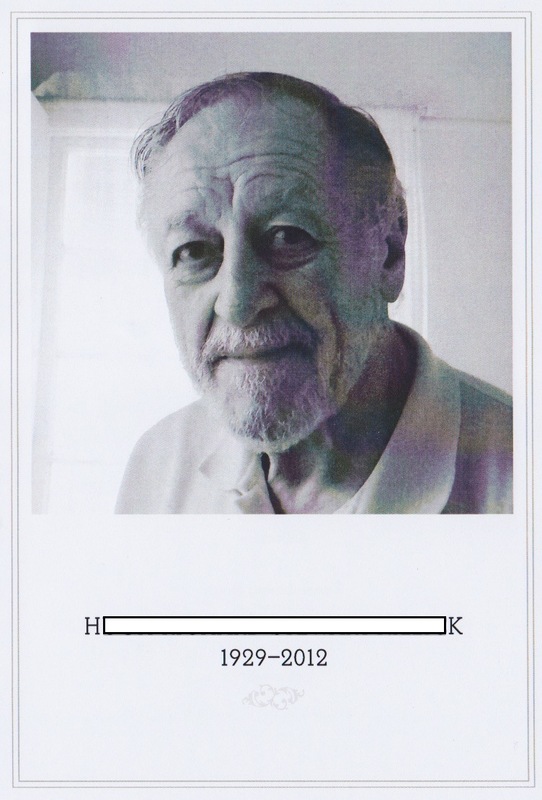 His picture was on the front, as seen in figure 1. 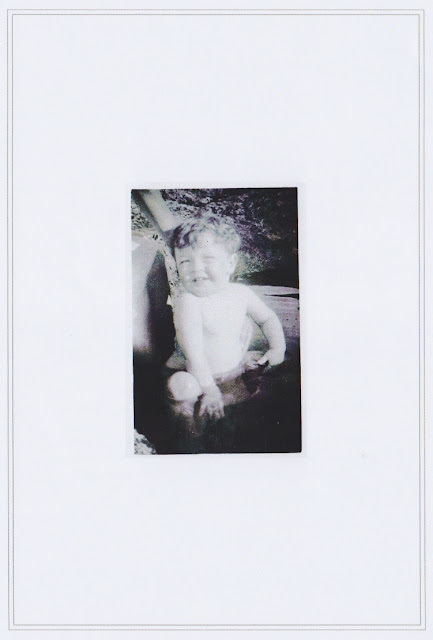 The back had his name, date of birth, date of death and a small message as seen in figure 2. At the bottom of the back was an ad for the funeral home, and nobody minded this ad. Actually I, and others, appreciated it as it's a great way to see which company did the funeral. It is a great idea that I hope is a standard option with all InvoCare companies. Naturally working in a funeral home I have developed a different view and understanding of funerals. I do not and cannot see them the same way as I did before joining the industry. It's strange how others do not see the same things I do when we are presented with the same scene. For example I noticed that they turned the coffin anti-clockwise instead of clockwise, and that the conductor only used one hand while simultaneously talking to the family. To me these are two rather large mistakes, the coffin should always be turned clockwise (to represent the passage of time) and it should be treated as important enough to use both hands. 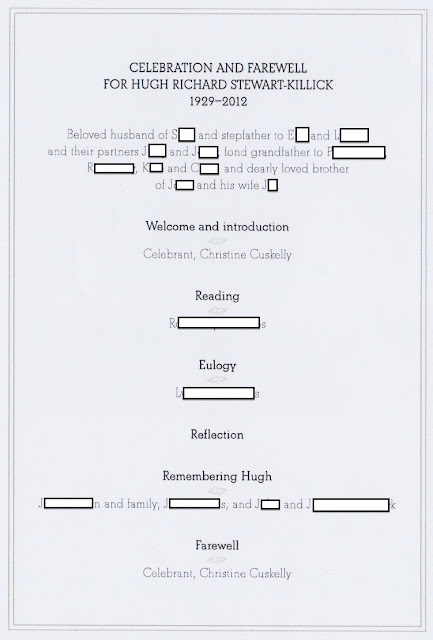 While I noticed this nobody else did, none of my family or the other mourners saw the mistake. Once I mentioned it they realised, but until I said it they never thought of it. Another 'mistake' was the instructions given by the conductor. The family were to wheel out then carry a short distance to the hearse. The conductor instructed us to wheel by the handel, incredibly strange and actually quite difficult to do. To wheel by the handel one has to bend and cannot push as hard or as accurately as needed. Instead I have always been taught to wheel by the thumbscrews. Taking ahold of the thumbscrews and pulling or pushing them to move the coffin is much better and safer. It means there is no risk the coffin will slide off the trolly and needs less effort to move the thing. So naturally I took hold of a thumbscrew and they held the handels. Then they did not push much meaning I had to push it along, difficult to do well with just one corner. The other issue was as we went down the stairs, the conductor had not told everyone to keep it level, as in raise the lower end. Keeping it level makes it easier and safer to carry and means anything like flowers wont slide off. Again, it was lucky I was at the lower end and knew to keep it level. I feel the conductor should have given better and different instructions. 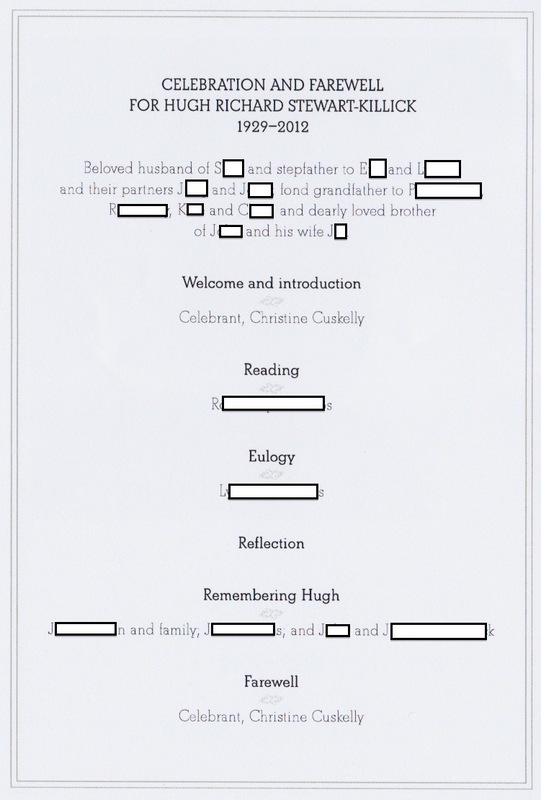 Not only do I see these little mistakes but I see the whole funeral differently to others. To me it is not as sad as other people found it, well, that isn't right. I have been to a lot of funerals and as such they have become mundane and predictable. In just one year I lost count of how many funerals I went to. So for me a funeral was almost like another day at work. However most other people go to a handful of funerals in their whole life. For them it is a special unique event which they have little experience with. So I took pictures with my phone, which I noticed others saw as strange. Nobody took issue with my taking photos (mainly as I was discrete) but they did not like it. It made them uncomfortable, and when I questioned this they could not exactly say why. They said it was "unusual" or "not normally done", but this is not a good reason as while the unusual our strange can make us uncomfortable it was not the impression I got. I'm not sure why it made people uncomfortable but it was because it was more than just 'unusual' to them. It was almost wrong, taboo or inappropriate to be taking pictures there and then. But I took them anyway, and know that in the future others will appreciate it. However my previous experience at funerals has almost always been as an undertaker and not as a mourner. One moment in particular made me realise how I didn't actually know what to do as a mourner and how others must feel at funerals. The desire not to mess up, to get everything right and yet the lack of experience or understanding about what is going on. This moment was just after we loaded the coffin into the hearse. I went to stand next to the hearse driver and realised that was wrong, it was were the undertakers stood, not the mourners. Then I stood there for a moment, unsure where to go. So I took a few steps back and stood with the crowd of mourners. But it was really surprising, how my instinct kicked in and I made my way to stand next to the staff and did not know where to stand as a mourner. 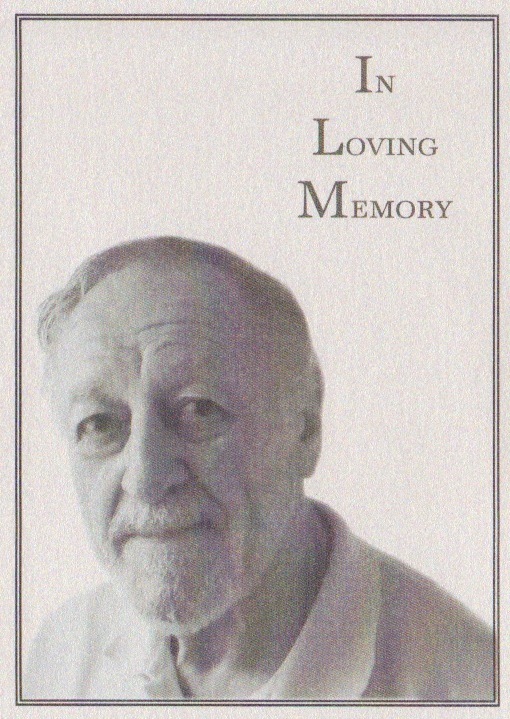 Front of the Order of Service book. The next thing was when they shut the door of the hearse I immediately thought of going back inside and moving the trolley which the coffin had been wheeled on. I even started to move off and realised everyone else was still standing and watching the hearse. Without instruction or communication they had all just known to wait until it was out of sight. Whereas I was wanting to move away, because as an undertaker we are not to move until the back door is shut. Once shut we immediately make our way about to the various things that need doing. And this is exactly what I was instinctively doing, to me shutting the door is the signal to move away. People do not normally notice but all the undertakers will evaporate away from the hearse at this point. Thus I found it strange and awkward that everyone stood about and expected me to stand about also, normally I can and should leave at this point. It was just really strange and uncomfortable for me. It was that unsure feeling as though something had been forgotten. Like wondering if you really locked the car, or left a light on or whatever. I also felt like this as I entered the funeral, it was so odd to be signing the book rather than getting people to sign. As I walked in I felt as though I should be behind the table with the book. It was so very unnatural to be standing in the room as a mourner. Then sitting there at the front during the service was also odd. I had always existed outside the service until the end points. I would wait outside, or sit way at the back, never had I sat down amongst the other mourners. All through the service I felt out of place, that I should be at the back with the other undertakers. Now I know how many mourners feel at funerals. Unsure what to do or where to go, and with so much pressure to behave properly. A funeral is a rather busy event with a lot to know and yet nobody to tell you. So I will make more posts about how to be a mourner at a funeral and hopefully this will help someone someday. 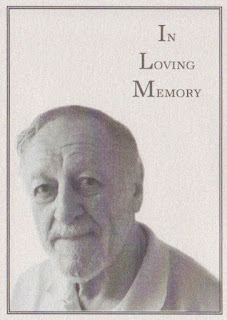 One of my other uncles on the other side of the family, unrelated to my grandfather attended the funeral. He had gotten on really well with my grandparents for several years and it was nice he could come. After the funeral I was chatting to him and he said how strange it was that nobody was in tears much. To me that was normal, people were sad but not bawling their eyes out. Yet to him, being Greek, people are normally very emotional at funerals, and with life in general. I thought that was an intriguing comment about the emotional display. It really supports this other post of mine about how emotional displays (such as crying) is socially and culturally learned rather than instinctive. And all this is after just one year in the industry! It makes me wonder how other undertakers who have been doing this for decades feel as a mourner. Perhaps they do not feel as out of place as I did or maybe they feel more out of place. As for the funeral home I would be happy to go back to them. The staff were nice, approachable and acted professionally. So overall I feel there was good value for money and they did do a good job. The mistakes they made would go unnoticed with most mourners and did not impact affect the service. The family car which drove my grandmother. The hearse about to turn onto the road and drive away. 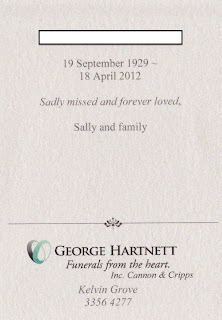 Inside the Order of Service, first page. 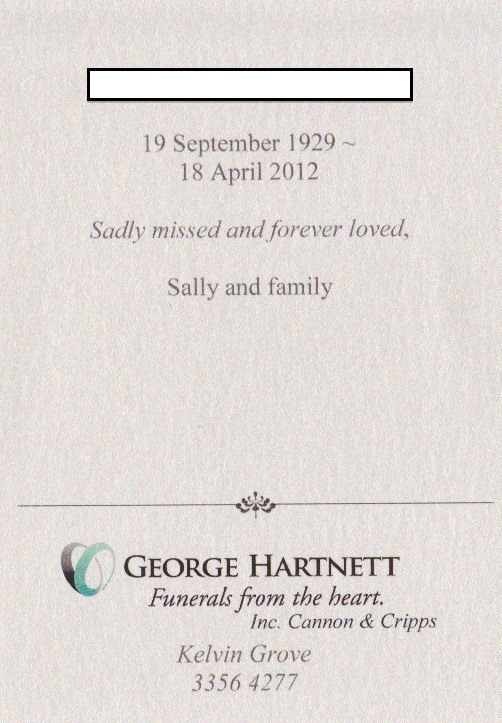 Inside the Order of Service, second (and last) page. Back of the Order of Service book.